Digitized Service Record is under Briggs, Nassan Service no. 466681. Notes: Some confusion regarding his actual first name. Several different spellings in the service record. 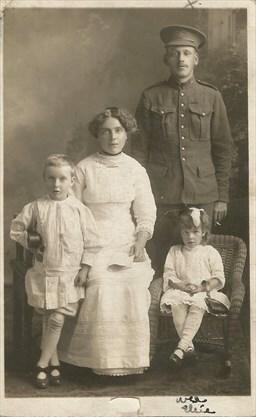 Sergeant Briggs and family, circa 1915-1919. He is with his wife Florence, daughter Elsie and son Ernest. Source: Karen Lucas. 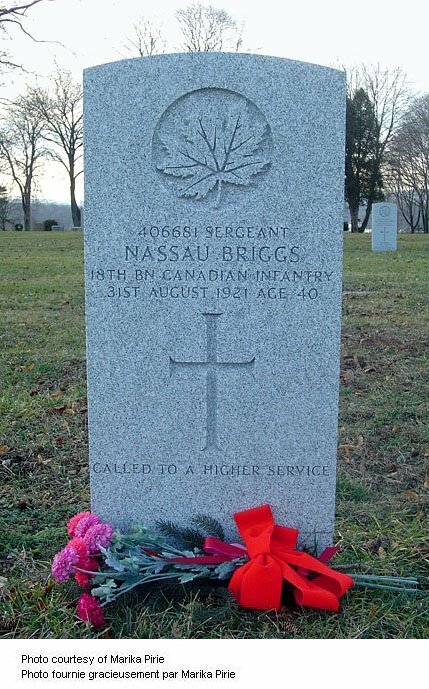 Summary of Service[i] for Sergeant Nassau Briggs, reg. no. 406681. June 12, 1881 Born Born at Leeds, Yorkshire, England. March 22, 1915 Enlists Enlists with the 36th Battalion at Hamilton, Ontario. He is a 33-year old labourer and is married to Florence Briggs, residing at 35 Ardvollien[ii] Street, Hamilton. He has no prior military experience. April 1915 Assigns Pay $20.00 per month to his wife Mrs. Florrie Briggs. May 1915 Separation Allowance $20.00 per month to his wife Mrs. Florrie Briggs. November 1, 1915 Transferred Transferred to 18th Battalion. December 21, 1915 Admitted Admitted to No. 5 Canadian Field Ambulance. Carbuncle. December 30, 1915 Admitted To a Casualty Clearing Station. January 8, 1916 Discharged Discharged to duty and rejoined unit. February 19, 1916 Admitted Admitted to No. 5 Canadian Field Ambulance. February 20, 1916 Admitted Divisional Rest Station at Goderwaerovelde. March 7, 1916 Admitted Admitted to No. 5 Canadian Field Ambulance. March 8, 1916 Admitted Divisional Rest Station at Goderwaerovelde. March 13, 1916 Admitted Nor. Med. Divisional Casualty Clearing Station. March 15, 1916 Discharged Discharged for duty. March 31, 1916 Admitted No. 14 General Hospital, Wimereaux, France. April 16, 1916 Admitted Admitted No. 5 Convalescent Depot, Wimereaux, France. April 26, 1916 Discharged Discharged to Base Depot. May 5, 1916 Arrives Arrives with 18th Battalion “In the Field”. December 29, 1916 Leave Granted 10 days leave. November 18, 1917 Admitted Admitted to No. 5 Canadian Field Ambulance for impetigo. November 27, 1917 Discharged Discharged to duty. December 8, 1917 Granted Leave 14 days leave to England. October 14, 1918 Admitted No. 4 Canadian Field Ambulance the to Casualty Clearing Station. Inflamed glands. October 21, 1918 Admitted Admitted to No. 18 General Hospital. October 23, 1918 Invalided to England Invalided to England, sick. October 21, 1918 Taken On Strength T.O.S. with the Western Ontario Regimental Depot at Witley, England. November 20, 1918 On Command On Command with No. 1 C.C.D. April 1, 1919 Taken On Strength T.O.S. “P Cadre”. March 9, 1919 Admitted Admitted for synovitis of the knee at 1st C.C.D. June 9, 1919 Appointed Appointed Acting/Corporal with pay. June 29, 1919 Medical Exam Medical exam in preparation for return to Canada. June 30, 1919 Dental Exam Dental exam in preparation for return to Canada. August 9, 1919 Appointed Appointed Acting/Sergeant with pay. September 9, 1919 Taken On Strength T.O.S. “R. Wing” at Witley. September 20, 1919 Struck Off Strength S.O.S. to Canada. October 6, 1919 Discharged Discharged at No. 2 Military District, Toronto, Ontario. 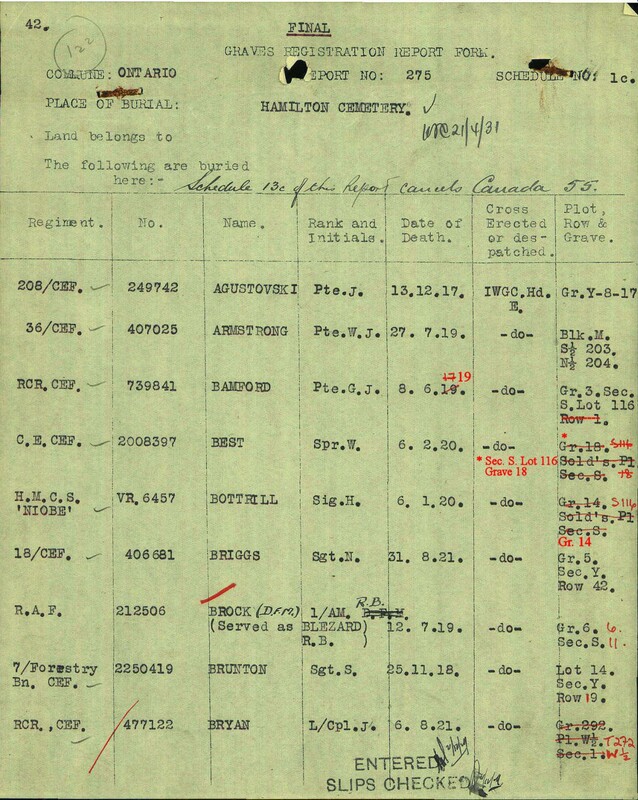 Eligible for War Service Badge, Class A.
October 20, 1920 Change of Address Change of address for Mrs. N. Briggs to 315 Mary Street, Hamilton, Ontario. August 31, 1921 Dies Dies due to service. Buried at Hamilton Cemetery. 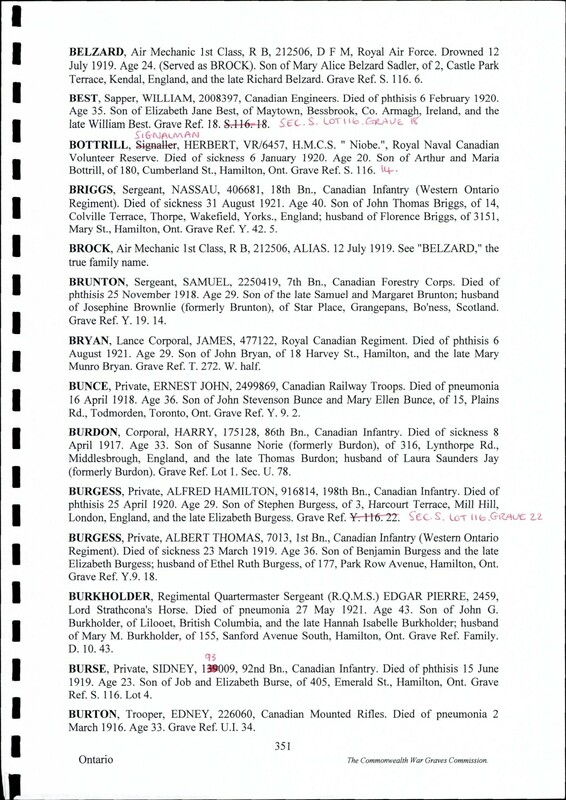 He is officially the last Canadian soldier of the Great War to die according to the standards invoked by the Commonwealth War Grave Commission. April 26, 1926 Scroll Despatched Scroll no. 2135 despatched to Mrs. F. Biggs. January 20, 1927 Plaque Despatched Plaque no. 2890 despatched to Mrs. F. Biggs. [ii] No reference to this street found. Source: CVWM via Marika Pirie.